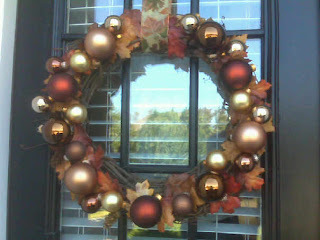 Last year, I helped my mom make some amazing Fall wreaths for our doors at home. They were perfect to put up in September, and then you can keep them up all the way through Thanksgiving. We looped ribbon through the top to hang them over the doors. I also helped Mom make two more for Christmas, and I made one for my condo's door too! I wanted to tell you how to make this type of wreath yourself, since it is extremely easy and fun to DIY. Plus, why spend over $70 on this look-a-like from Pottery Barn (I think its sold out already anyways!) when you can make one of your own for less than $25? * Ball ornaments of varying colors and finishes - we liked combining shiny with matte, in particular. Target has a great selection. * One wreath - check Target or Michael's for cheap but quality ones. Lay out the wreath on a table, and "arrange" the ornaments on it where you think they look best. Doing this ensures that you can spread out the colors of the balls in an equal but varying manner. Leave a space among the ornaments for the bow. We put mine off-center at the top, an updated version of traditional wreaths you might see. Make the bow by grabbing the a section near the end of the ribbon, and then looping it up and back and few times, and then securing it with a twist tie at the base. Wired ribbon makes this easy because you can bend and flex it all around as you go, and it also makes it easy to fix when you pull it back out each season from storage. Heat up the glue gun, and then put some glue on the back of one ornament. Push the ornament down into its place back on the wreath and hold it for 10-20 seconds before moving on to the next ornament. Finish the arrangement by gluing the bow into its spot and fluffing the wired ribbon up. Tight on space for storing decorations? I store mine in a large trash bag high up on a shelf in my closet in the off-season, but they sell special wreath boxes at places like Target, too. If you make a wreath of your own, please send me a picture - I'd love to share the success stories!